Indie filmmaker John Sayles ventured into more commercial territory with Baby It's You, his affectionate, melancholy-tinged look at 1960s New Jersey teenagers. Although uneven and choppily paced, this early '80s critical darling is worth a peek for Rosanna Arquette's natural performance. The film's Blu Ray release is typical of Olive Films' product, nice looking yet sorely lacking on content. Filled with casual, realistic dialogue, Baby It's You places observant accuracy over cheap nostalgia. Sayles' script has a keen sense for the way real teens behave, regardless of the era, which makes this (admittedly flawed) film hold up pretty well. It's exemplified by Arquette's freshness as a confident, attractive high school student who loses her way in her first year of college, the entire time ardently pursued by Vincent Spano as an Italian would-be singer who matches the Arquette character in ambition if not smarts. Opening in a bustling New Jersey high school in 1966, Arquette's Jill Rosen is introduced as the gamine queen bee of her class clique - not especially popular, yet well-groomed and sure of herself. She's one of those haughty teens who seem sure enough of their own intelligence (Jill aspires to be an actress), yet strangely sheltered and woefully unprepared when it comes to post-High School life. Jill gets the flirty attentions of a cocky fellow known as the Sheik (Spano), a dapper-dressing, slick-haired '50s throwback who idolizes Frank Sinatra. Although she resists him at first, the persistent boy persuades her to go out on a date. They eventually become a semi-couple, although Jill easily drops him once she secures the lead role in the school play, advised that it wouldn't be good for her career prospects being seen with a lowly greaser. The girl's upward trajectory is complete upon her acceptance to the prestigious Sarah Lawrence College. 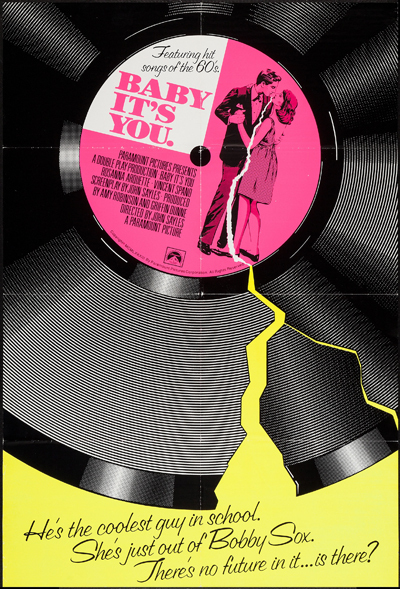 Knowing, atmospheric and nicely played in its first hour, Baby It's You takes a detour into familiarity for its second half, with Jill and the Sheik gone their separate ways and adjusting uncomfortably to a post-graduation world. Things get melodramatic when Jill becomes isolated in college - no longer a star pupil, she's just another acting student dealing with her proto-hippy coeds and the on-again, off-again wooing of a smarmy Princeton man played by Matthew Modine. Meanwhile, the Sheik is living the dream (of sorts) by lip-synching to Sinatra records to the blue hair clientele in the Florida hotel where he works as a dishwasher. It's no spoiler to reveal that they eventually get back together. Unfortunately, much of the goodwill built by these characters gets muddled over by film's end. Despite those problems in the second half, Baby It's You remains a rewarding watch. Arquette displays the same insouciant charm she had in After Hours and Desperately Seeking Susan, while Spano does well conveying his character's mixture of raw magnetism and bluster. Although Sayles strangely decided to dress up some of the Sheik's scenes with out-of-place Bruce Springsteen songs, the soundtrack manages to be evocative of the time - even when the costumes and production design falter. Olive Films' edition of Baby It's You supplants the 2008 DVD released by Legend Films in 2008. Like the earlier edition, this Blu Ray is a no-frills disc with only the film. Featuring a posterized portrait of Rosanna Arquette, the updated packaging fails to capture the film's atmosphere or setting. The widescreen, 1.78:1 aspect ratio image on Baby It's You's Blu Ray showcases the photography in solid fashion. The cinematography by Fassbinder favorite Michael Ballhaus sports pleasant, realistic color and rich dark values - his imagery is well-captured in this transfer. The film print used on this disc shows its age with faded color and occasional dust and specks, although it's stable and free of major flaws. Similarly, the soundtrack is an aged yet satisfactory affair with some distortion creeping in during the music-backed segments. Dialogue is relatively clean in this stereo mix, despite the limited dynamics. No subtitles are included. Zero. The simple menu sports two options - "Play" and "Chapters." John Sayles' affectionate 1983 ode to '60s teendom, Baby It's You still holds its considerable charm despite an unfocused second half. Olive Films' Blu Ray edition is a good opportunity to revisit this observant New Jersey-set tale, with a winning performance by Rosanna Arquette. Recommended.